What does it take to get the first chair on an opening day? Sleeping in the lift line doesn’t hurt, although it may be cold. And when you’re desperate to rack up vertical feet to add to the EpicMix pot, it may be a sacrifice you’re willing to make. Mikey Fehrle and Caleb Sizemore from Denver and Noel Henry, Kevin Stevens and Zach Gajewski from Castle Rock, Colo., made just such a sacrifice to nab that elusive first gondola at Keystone ski resort on opening day. 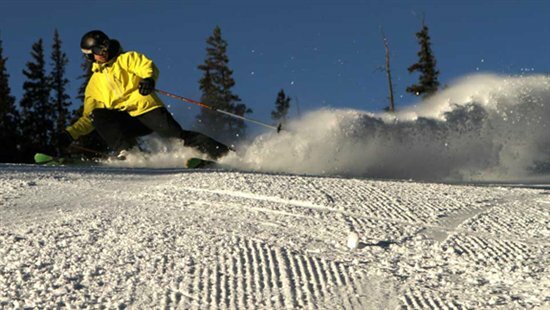 On top of the unofficial title, these guys will earn the “First Chair” pin on EpicMix, the new online and mobile application from Vail Resorts that lets skiers and riders track their vertical feet and days skied. The application will go live Christmas 2010 and is now counting the total vertical feet racked up at Keystone. As Breckenridge opens next week, and Vail, Heavenly and Beaver Creek after that, the number of vertical feet will get larger. Through the Epic Holiday Gift contest, $1 will be added to a pot for every 30,000 vertical feet skied. Between when the application goes live and Dec. 28, 2010, as people activate their EpicMix accounts, they can be entered to win that pot – up to $100,000. After day one at Keystone, 13,513,336 vertical feet were racked up – equaling $450 in the pot. Besides the launch of the EpicMix vertical feet tracker, skiers were excited to get to the park on opening day. 28 features were available to the eager jibbers who had waited all summer to get back into the park. Terrain park pros Bobby Brown, Banks Gilberti, Grant Savidge, and Keri Herman also made an appearance – starting their early season with some on-snow training. For most, getting the chance to ski or snowboard was enough reason to come out for opening day. Little kids were in ski lessons, beginners were learning the ropes at the bottom and families were out enjoying a beautiful blue bird day on snow. To see all the pictures from opening day, click here.